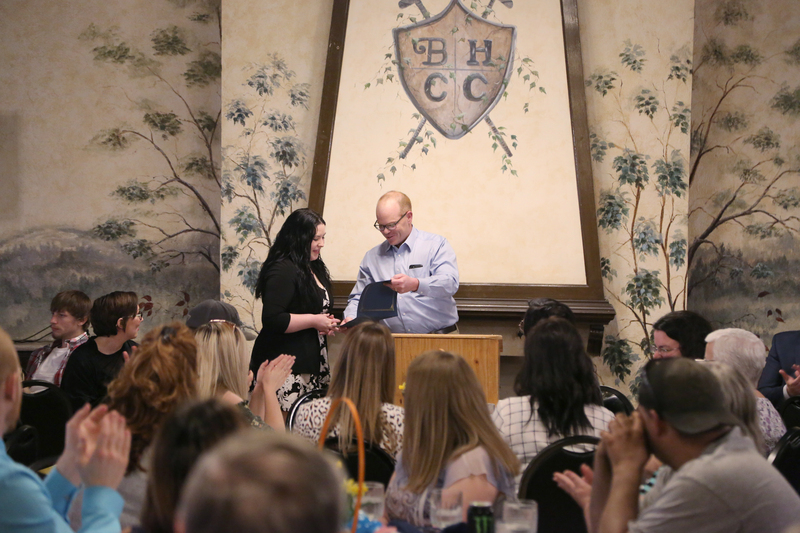 St. Clairsville, OH (April 12, 2019) — Belmont College recently hosted their Annual Student Awards Banquet on Thursday, April 11 at the Belmont Hills Country Club in St. Clairsville, Ohio. The purpose of this event is to recognize students for academic excellence and student leadership. Bryan Woodford, Director of Critical Care and Cardiac Services, Wheeling Hospital presented the Wheeling Hospital Human Touch Award to Associate Degree Nursing Student Charlie Scatterday (left) of Powhatan Point, Ohio. More than 50 students received awards for their academic achievements or their contributions to the campus community (see list below). Wheeling Hospital Human Touch Award Evening: Minnia Kittel, Cadiz, Ohio.